Last year, Olentangy Orange Middle School students raised approximately $9,000 that was divided between the Orange Township Veterans Memorial and Honor Flight. On Friday morning, students surpassed their goal of $5,000 during the 2017 Honor Walk. 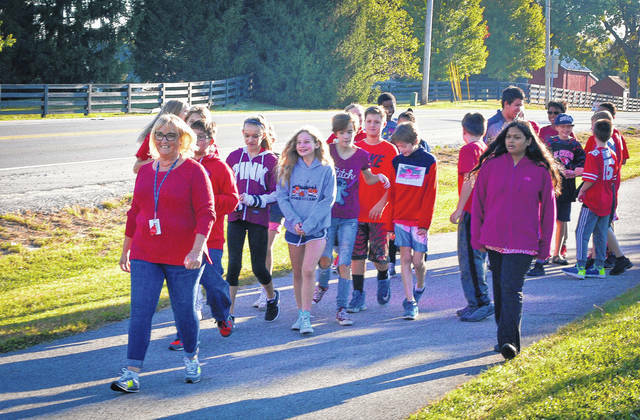 Students from Melanie Williams’ social studies class spent the period walking from the school’s track to the corner of Orange Road and South Old State Road near the planned Veterans Memorial. Raising money to benefit Orange Township’s Veterans Memorial, Blue Star Mothers of America and Honor Flight, Olentangy Orange Middle School students participated in the second annual Honor Walk last week. Last year students, raised approximately $9,000 that was divided between the memorial and Honor Flight. Students spent their social studies period last Friday walking from the school track to the planned site for the Orange Township Veterans Memorial at the corner of South Old State Road and Orange Road. Marconi said students were encouraged to ask family and friends for a $5 donation to sponsor them on the walk. Orange High School student Amelia Dewey’s design, Heroes Not Forgotten, was chosen in 2013 for the memorial. Pinned to the back of each middle school student were the names of veterans to whom they dedicated their walk. “The goal was to walk a mile,” Marconi said. She told the students that they were walking to honor those who protected their rights and freedoms. She wanted them to especially keep in mind the Ohio Army National Guard’s HHC 371st Sustainment Brigade currently deployed in Kuwait, which flew an American flag in honor of the school’s walk. Amanda Sheterom, Orange Township’s communication manager, said students donated $5,505 from the 2016 Honor Walk and other fundraisers for the township memorial. Sheterom said construction of the memorial was to begin sometime this year, but has been delayed because of the road construction on the corner of South Old State and Orange Road. Once the road work is complete, construction of the veterans memorial can start. She said the cost of the memorial is just under $400,000. This entry was tagged delaware, Olentangy Orange, Orange Township, Veterans Memorial. Bookmark the permalink.